Impro in the UK is primarily bound up in most peoples minds with sketch based Whose Line is it Anyway style comedy. 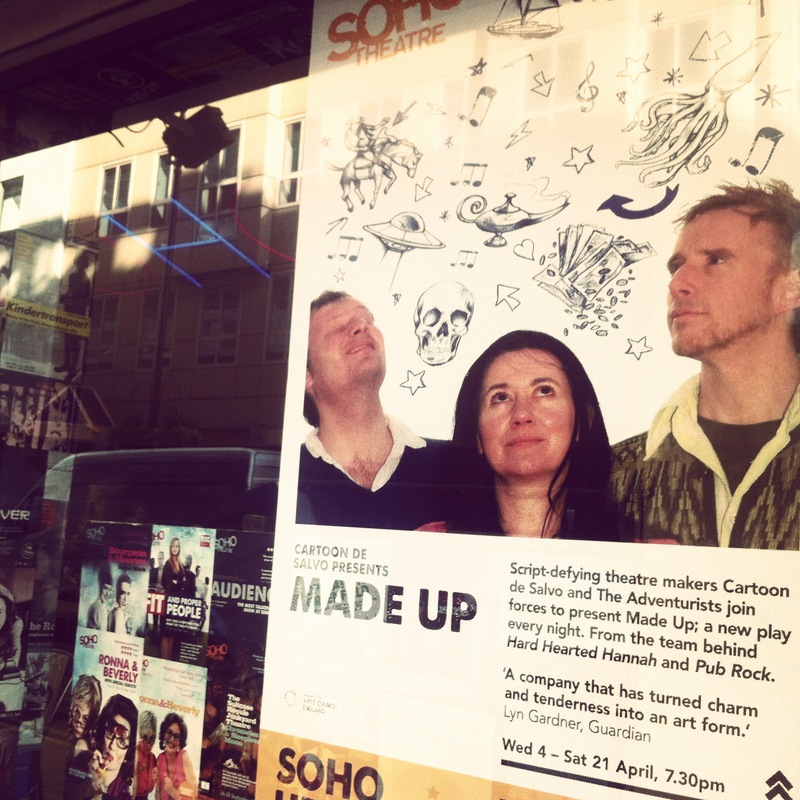 Following training with San Francisco’s Bay Area Theatresports Cartoon de Salvo became one of the very few, certainly one of the highest profile theatre companies, attempting Long-form impro or story based impro in the UK. We were interested in the possibilities of using actors rather than comedians in improvising plays. Long form has a twenty year history in the States but is not developed here and we’ve found much of the work that is going on in this country involves some kind of ‘landing place’ or structural safety net. What excited us was not only the thrill of being cast as actors in any place, time, role, genre…but the total immersion and trust in the unknown. When we start our stories we have nothing but a title. We work on finding the reality of each story rather than following the formulas of genre parody. We don’t confer, and in over 80 different stories we have rarely repeated a beat of storytelling. This in itself was never planned! We place our trust in each other and are a strong ensemble. In Hard Hearted Hannah and Other Stories, our first foray into long form, we improvised from a title and also use 3 chosen songs from our band. We’ve discovered that music – which is the art form most happily married to impro – generates the most interesting material and surprising and radical impro decisions. And live music has become one of the company’s hallmarks and one in which we want to continually challenge our selves and push forward. One of the issues with improvising entire stories is that we make too many verbal ‘offers’ which can be tricky to tie up; but more importantly tricky to make resonant and significant – because they come so thick and fast! Music has the power to make abstract offers – which seemed to give us permission to make stronger choices – because music can really ‘nail’ emotional moments in a story. We discovered that if we’d actually sung a song about something; then that very much made that something an offer we had to deal with fully and this in turn freed us up to go much further than we’ve ever been able to before. We challenged ourselves as performers to make more direct emotional offers and opened up to each other about tendencies we fall into as an ensemble and how to push ourselves outside our comfort zone. Opening your mouth to sing a song with no structure or genre cliché to fall back on is indeed a very scary thing. So adding that challenge into the mix enabled us to revisit the adrenalin of when we first learnt to improvise and learnt to fully support each other in going into the unknown. We do this with a Brighton-based band The Adventurists, multi-instrumentalists including steel pan, harp, double-bass and fiddle. They are an improvising band; they are in a way the Salvo’s musical counterparts. They set up in order to improvise entire gigs – none of their music is recorded. Each gig is that night only. We also happen to share musical taste very closely. We were delighted to have met each other and had fantastic conversations about improvisation and the key notion of respect and letting go of judgement both of oneself and others. The Salvos and the Adventurists show Made Up ran at the Soho Theatre in 2012, later at Secret Garden Party and Pulse and is a life-long adventure into who knows where. During the Soho run we were joined by guest improvisors from two of our favourite UK bands, Paul Butler from The Bees and Dan Smith from The Noisettes. Interview here about my improvised work in Exeunt online magazine.